The tire pressure warning valve and transmitter constantly sends radio waves to the tire pressure warning ecu. Under the following conditions, the tire pressure warning antenna and receiver is unable to receive the signals from the tire pressure warning valve and transmitter, and a dtc is output. Areas, facilities, or devices that use similar radio frequencies are located in the vicinity of the vehicle. Devices using similar radio frequencies are used in the vehicle. Dtcs c2121/21 to c2125/25 can only be deleted by the tester. Dtcs c2181/81 to c2185/85 can be deleted when the transmitter sends a forced transmission signal or the test mode ends. Dtcs c2181/81 to c2185/85 are output only in the test mode. When no signals are received for 60 minutes or more, a dtc is output. It is necessary to perform the procedure to identify the tire pressure warning valve and transmitter that is malfunctioning because it cannot be identified by the output dtc. It is necessary to register an id code after replacing the tire pressure warning valve and transmitter and/or the tire pressure warning ecu (see page tw-9). Set the pressure of each tire to the specified value. Select tirepress by following the prompts displayed on the intelligent tester. Rapidly release the tire pressure from any tire by 40 kpa (0.4 Kgf/cm2, 5.8 Psi) for 30 seconds or more. Identify the malfunctioning tire pressure warning valve and transmitter by rapidly releasing the tire pressures from each tire. Record which tirepress data (id1 to id5) corresponds to each tire. It may take up to 1 minute to display the updated tire pressure data. When the tirepress data (ids 1 to 5) changes, reset the tire pressure of the tires to the specified value, rotate the tires 90 to 270° and recheck. When the transmitter is normal, record the tire location and the transmitter id. When the tirepress data (ids 1 to 5) changes, repeat the same procedure on the rest of the tires (one by one) to identify which tire pressure warning valve and transmitter the dtc corresponds to. 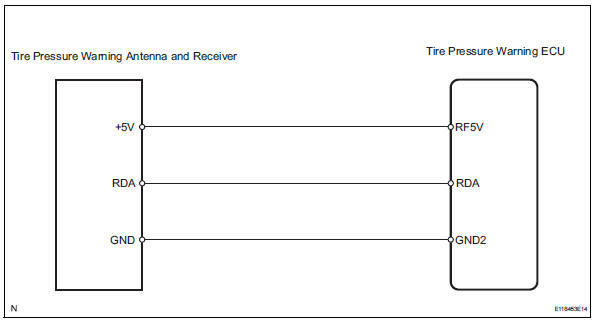 Check all transmitters of the tires. Select regit id code by following the prompts displayed on the intelligent tester. 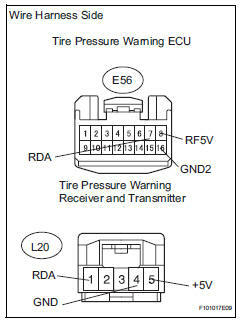 Remove the tire pressure warning valve and transmitter and check its id number (see page tw-61). 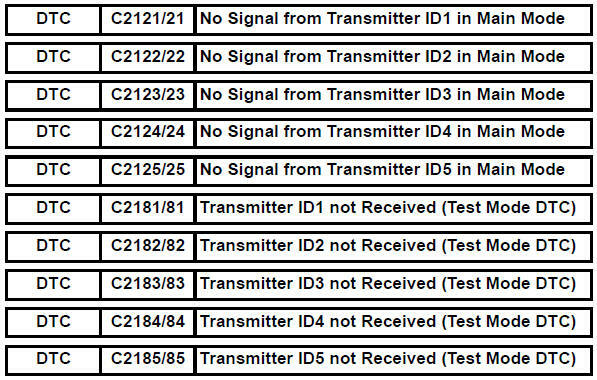 Check whether the recorded transmitter id and the actual transmitter id match. Disconnect the e56 ecu connector. Disconnect the l20 receiver connector. 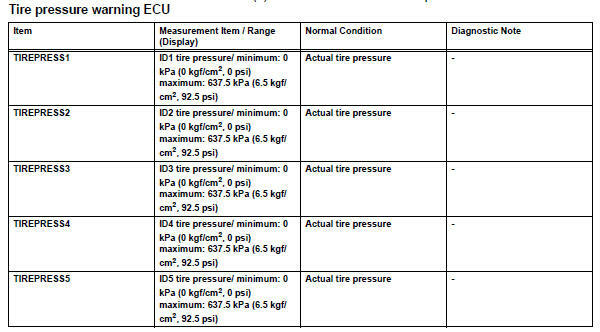 Check the data list tire pressure valve. Ok: all tire pressure readings are equal to the actual tire pressure. 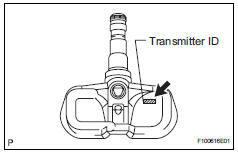 Remove the tire pressure monitor valve and transmitter check its id number (see page tw-61).